Here’s the irony of summer cooking: despite the powerful pull of all the warm weather bounty that’s suddenly available, one must also negotiate the fact that when the temperature spikes our willingness to stand over a hot stove often takes a dive. At least that’s been the case for me during the past few weeks, a period in which it was all I could do to whip up a batch of salad dressing, the mountains of tantalizing local greens at my neighborhood greenmarket notwithstanding (and okay, I was also on vacation, so that surely had something to do with this sudden onset of laziness as well). Still, the phenomenon is a real one, which, I suppose, is how the barbecue earned its place in the American cooking arsenal. The problem is that for many city dwellers, outdoor grilling is often not in the cards, a reality that leaves us with what other options exactly—ordering in Italian and calling it a night? That approach might get you through a few meals, but nothing kills the joy of eating faster than a steady diet of takeout (and I’m speaking from years of experience here). The solution, of course, is to land on the sorts of dishes that either don’t generate much heat during the preparation process, or to come up with meals that deliver the bright, summery flavors we yearn for this time of year but without spending hours in the kitchen to achieve them. Dishes like this one, which I pulled out of Gourmet a hundred years ago (or rather six years, to be precise), but that I only recently got around to trying. 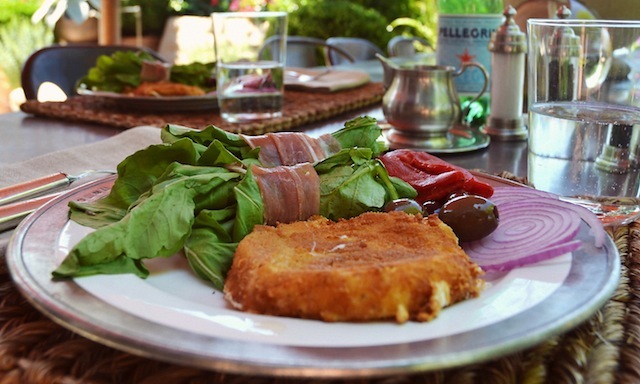 At its core the recipe is one for fried mozzarella, but a fried mozzarella that’s given a little (or a lot) of something extra, thanks to the presence of an anchovy-vinaigrette, which is drizzled across both the cheese and its arugula and prosciutto accompaniment. In other words, this is like one of those really great antipasto plates you can never get enough of, but streamlined and recalibrated for full-on entrée status. As such it has all the qualities necessary for a immensely satisfying summer meal—namely big flavors, a light touch, and one requiring only minimal prep time in the kitchen. Having said all that I should probably address what will likely be the biggest impediment for many of you where this dish is concerned: the presence of that anchovy paste in the vinaigrette. I mention this because most people I know—even those who eat almost anything (and I include myself in this group)—are anchovy-averse. The surprise, however, is just how well the flavor of the paste merges with that of the olive oil and the red-wine vinegar, bringing a salty snap to the mixture that’s blessedly free of any fishiness. It proves to be just the thing to round out the mild taste of the fried cheese, while also heightening the pleasant saltiness of the ham and mellowing the bitterness of the greens. All tolled, it’s a perfectly balanced marriage of flavors. And assembling the dish is easy too. To start there’s the trimming and washing of the arugula, the latter of these two steps being particularly critical, as arugula tends to be sandy and nothing ruins the pleasure of a meal faster than a mouthful of grit. 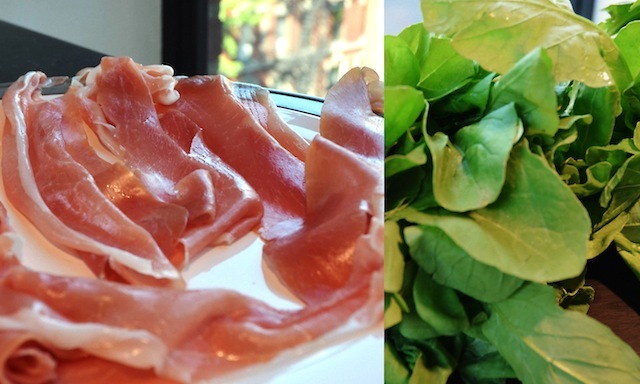 In any case, once cleaned and dried, the greens are divided into 8 small bunches, with each cluster tied loosely with a few slices of the prosciutto. 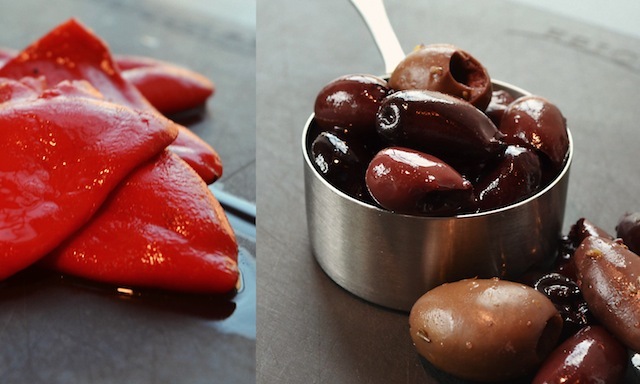 These can then be aportioned among four plates (two bunches per serving), along with the roasted red peppers, the olives, and the sliced red onion. Set these aside, then assemble the dressing, which requires nothing more than whisking a few tablespoons of red wine vinegar together with a single tablespoon of the anchovy paste, along with a small amount of salt and pepper, then slowly mixing in a quarter cup of the olive oil. The resulting dressing is so zesty, yet hassle free, that I’ve taken to using it whenever I’m looking for a simple way to enliven a bowl of greens. 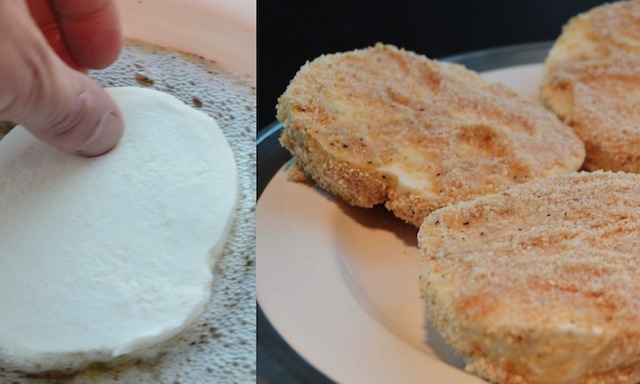 Of course, the fun really starts when you lay those thick slices of breaded mozzarella into a few inches of olive oil that’s been given a short time to heat up in your skillet. Two minutes (or so) is all it takes for the shimmering liquid to transform the pale, flabby rounds of cheese into something crisp, burnished, and utterly seductive—a quality that’s only heightened once the melted mozzarella begins forcing its way through the bronze casing surrounding the cheese. (Just try keeping your fork away when that happens!) Think mozzarella sticks, but lighter, brighter, and so much less greasy it’s even possible to imagine you’re eating something healthy. That difference, of course, is due in large part to the breading itself, which here comprises two elements: a simple mixture of egg whites whisked together with a small amount of salt and pepper, and the all-important breadcrumbs themselves (in this case, a fine, dry variety; store bought is a-okay). Since the egg white mixture functions as a kind of glue for what’s to follow, each cheese slice is introduced to the wet mixture first before being dragged through the crumbs, and then the whole process is repeated a second time, just to make sure everything is well-coated. You’ll know you’ve hit the mark when your fingertips are thick with what looks to be a cross between wet sand and pastry dough, as anything this hard to remove from your digits is likely to survive the hot oil in your frying pan. Crisped and golden, the fried cheese tends to take on a substantial quality that’s almost cutlet-like, a quality that makes this an ideal dish to serve to your non-meat eating friends. Of course, it isn’t a piece of pork or chicken—it’s a slice of cheese, and that much better suited to a light summer meal. And it doesn’t hurt that the various elements arrayed across the plate—the prosciutto-wrapped arugula, the onion, olive, and roasted red pepper medley, or the scene-stealing slice of golden brown cheese—make such a bright, summery picture. I could imagine eating this at a beachside restaurant somewhere, be it in California, or in Italy, or the south of France. In other words, it’s just the thing for a warm summer night in the city . . . or just about anywhere. 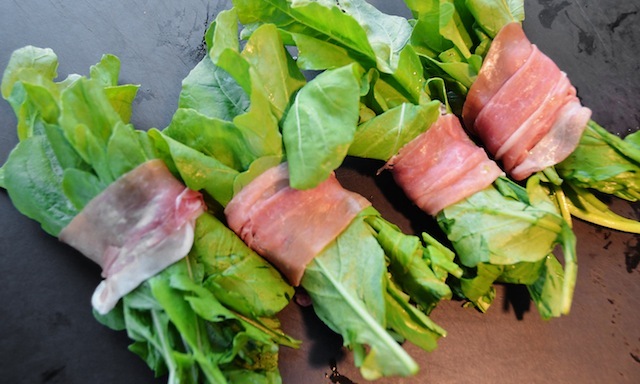 —Divide arugula into 8 small bunches and loosely wrap each with 1 or 2 slices prosciutto. Divide among 4 plates with roasted peppers, olives, and onion. 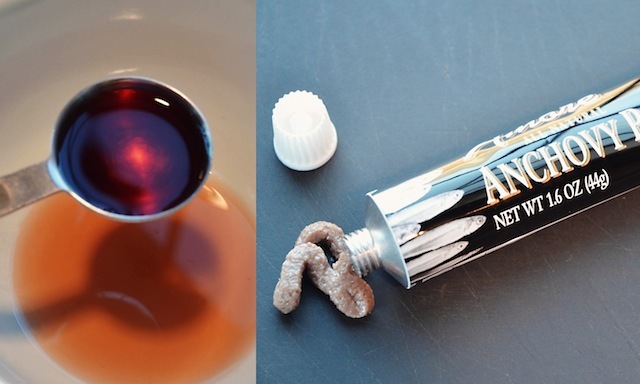 —Whisk together vinegar, anchovy, and ¼ tsp each of salt and pepper. Whisk in extra-virgin oil. 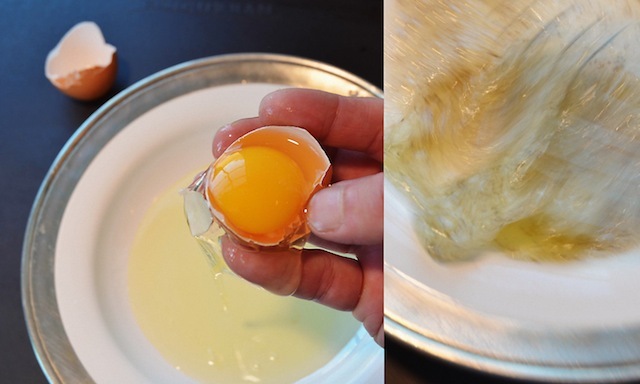 —Whisk egg whites with ½ tsp salt and ¼ tsp pepper in a shallow bowl. Put bread crumbs in another shallow bowl. Double-coat each slice of cheese by dipping in egg mixture, then crumbs, and repeating. Transfer to a plate. 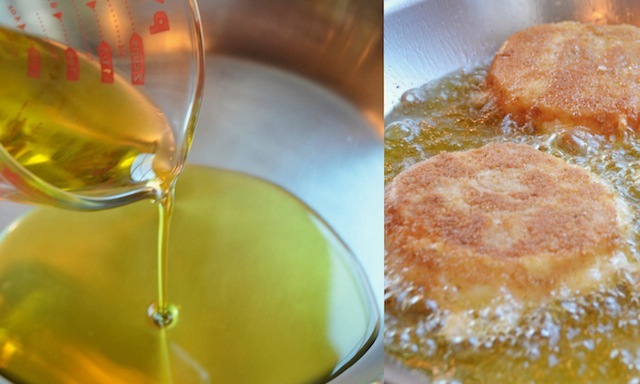 —Heat ½-inch olive oil in a 12-inch heavy skillet over medium-high heat until it shimmers. 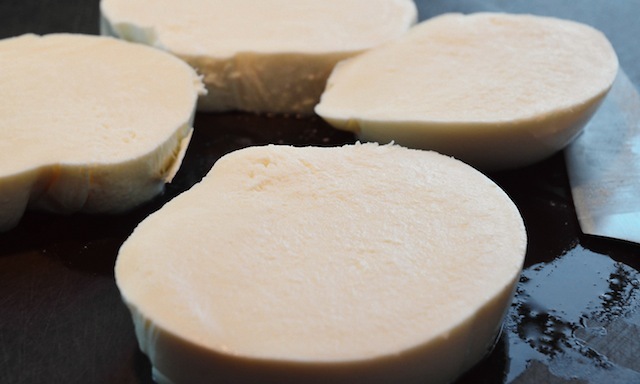 Fry coated mozzarella, turning carefully once or twice, until golden and cheese starts to melt but still retains its shape, about 2 minutes total. Drain briefly on paper towels, then transfer to plates. —Drizzle everything with vinaigrette and serve.